Can you guess what this object is — and what it does? Hint #1: This object is comprised of five of these panels. Hint #2: The answer is at the bottom of this webpage. Among the earliest artifacts in the Lovettsville Historical Society’s collection are five cast iron plates measuring approximately 18 by 30 inches that were found on property near Long Lane, west of Lovettsville. in 2003. They had been used as stepping stones on the site of an old spring house and are the gift of Alan and Louise Pipkin who owned the property in 2003 where the plates were found. The plates have low relief decorations of stylized flowers and arches reminiscent of Pennsylania German folk art, and are the main elements of what is called a jamb stove or five-plate stove. 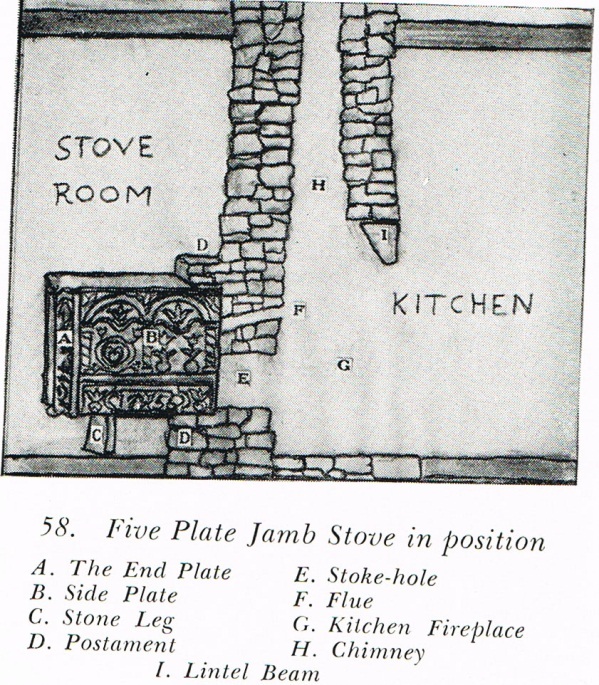 Jamb stoves were simply iron boxes held together by threaded rods. They were more effective for heating than an open hearth fireplace and relatively smoke and backdraft free. Early German houses in the region usually had two ground floor rooms. The hearth and chimney was in the center of the building and not at the ends. The first room was the kitchen-living and work room of the house. The room was dominated by the open hearth where all the cooking was done. The second room was the “good room” or “gute Stub”, a room reserved for special occasions such as weddings, funerals, boarding guests and entertaining. The good room was heated by the jamb stove. One fed the fire or live coals into the jamb stove through an opening from the open hearth side. 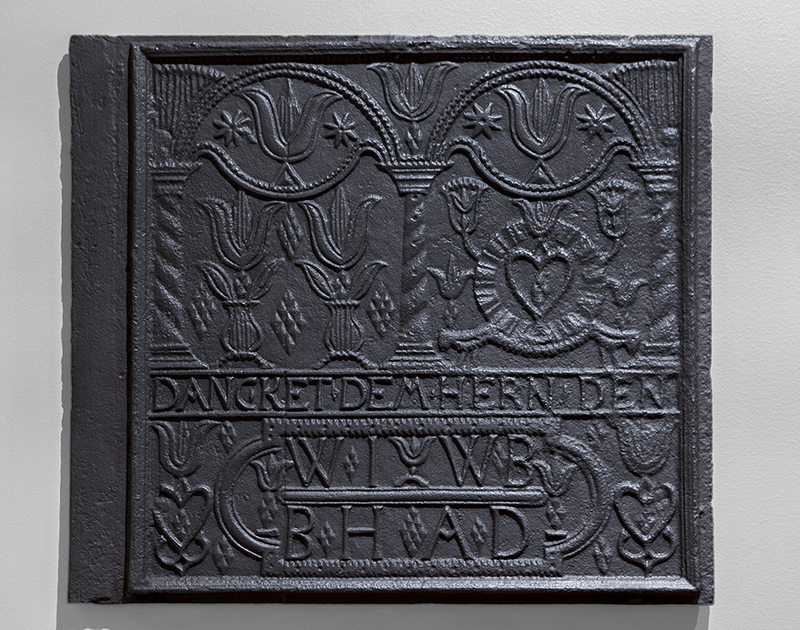 The combined inscription on the stove at the Lovettsville Historical Society Museum can roughly be translated as “He is happy who becomes pious and steadfast,” keeping in mind that it is not good German but a cobbled phrase from the psalms of the German Bible. 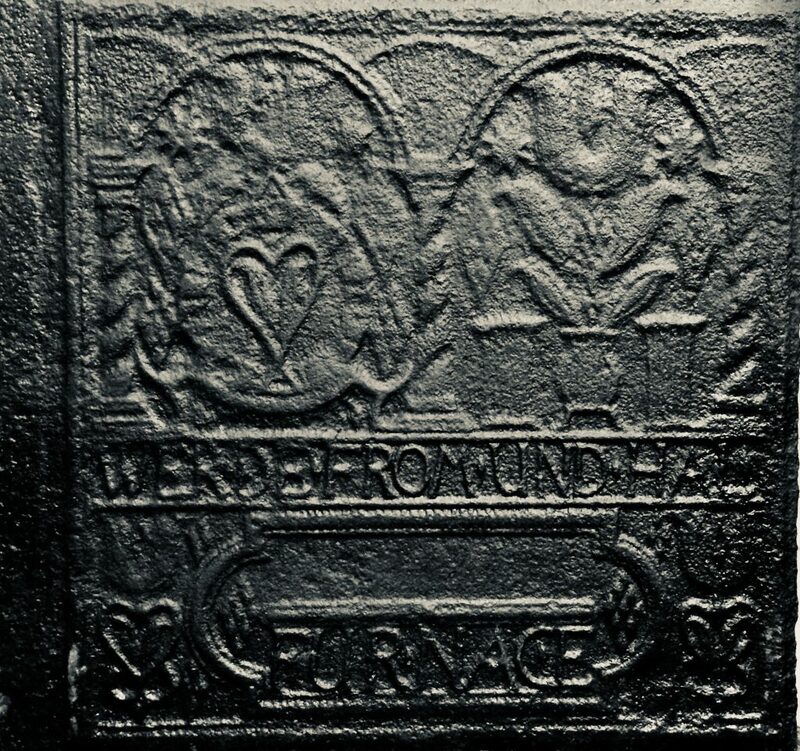 Other than the word “FURNACE,” no foundry marks are evident. It is doubtful that these plates wandered far from their source because of their weight. They may have been forged at the iron foundry located at Furnace Mountain, Virginia opposite Point of Rocks, or possibly at the Antietam Furnace which was located in Upper Antietam Hundred (1803 map) at the foot of South Mountain in Washington County, Maryland. Dr. Marc Howell of Frederick, who has conducted extensive research on Washington County iron production, points out that plates of very similar design to ours, were discovered at Antietam Furnace during archeological dig at the Mount Aetna Fire Company around 1980. Dr. Howell suggests that the wooden casting patterns for these plates may have been purchased in the area around Lancaster (Hopewell Furnace area) in Pennsylvania, and shipped via the Great Wagon Road which led from eastern Pennsylvania through western Maryland, and into the Shenandoah Valley. To transfer the design, the wooden patterns were pressed into a sand-filled casting frame impressing a three-dimensional image into the sand into which the molten iron was poured. Manufacture of the flat plate stoves gave way by the end of the 18th century. Advancements in technology enabled lighter and more finely cast stoves which were free-standing with a flue at the top plate that allowed installation into chimneys on the gable ends and outer walls of a building rather than a central chimney hearth. To learn more about these flat-plate stoves, see The Bible in Iron by Henry Chapman Mercer, Bucks County Historical Society (Doylestown, 1914) available online. 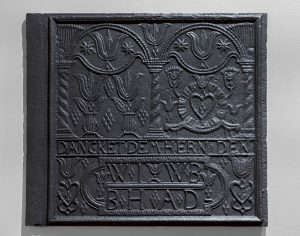 Illustrations of 19th century stove plates can be found there, and also on the “iron” pages of the Museum Of Early Southern Decorative Arts: https://mesda.org/lp/collection/iron/. That site shows a similar design produced at the Mt. 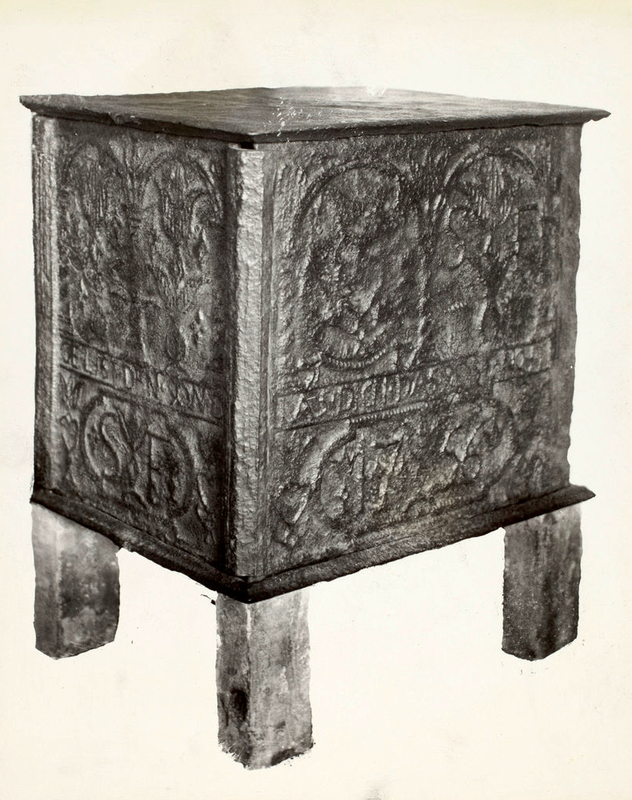 Aetna Furnace in Upper Antietam Hundred, and states that this design is closely related to several Pennsylvania stove plates dating from the 1740s to 1770s, which may have been the work of the German carver Heinrich Schneider. Left: Stove plate from Mt. Etna (Aetna), Washington County, Maryland, est. 1770-1780. 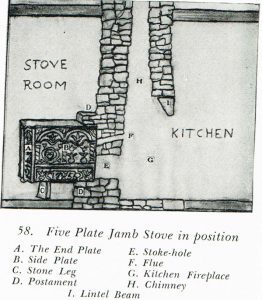 Scroll down to see images of how this type of stove looked when fully assembled, and how the stove was connected to the chimney of the dwelling. Read an article about German Jamb Stoves at the Conococheague Institute Blog. 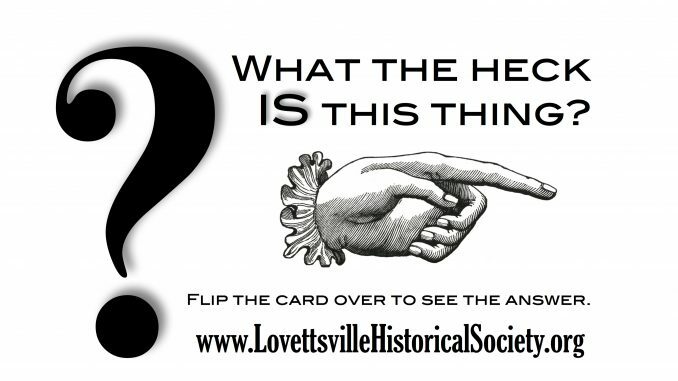 Visit our “What the Heck IS This Thing?” mystery objects exhibit and guessing game, on Saturdays between 1:00-4:00 at the Lovettsville Museum, 4 East Pennsylvania Avenue, next to Lovettsville Town Hall. The Lovettsville Historical Society is a nonprofit organization that relies entirely on volunteer help. Support our mission to preserve and protect the history of Lovettsville, The German Settlement, and our unique corner of Loudoun County, Virginia. Purchase a membership or make a tax-deductible* donation today. Visit us on the web at www.LovettsvilleHistoricalSociety.org. * The Lovettsville Historical Society, Inc. is a tax-exempt 501(c)(3) organization under the Internal Revenue Code. Contributions and membership dues are tax deductible under Internal Revenue Code Section 170.